you can try out the demo here http://www.flickrXplorer.net/ (sometimes service may be unavailable due to update pardon me for that). Currently, App is tested under IE 6 & 7, Firefox 2.0+, will update for other browsers as well. The location for the project : www.codeplex.com/flickrXplorer. Finally, have fun the new open source Flickr app and ping me if you have any suggestion to make it more interesting. 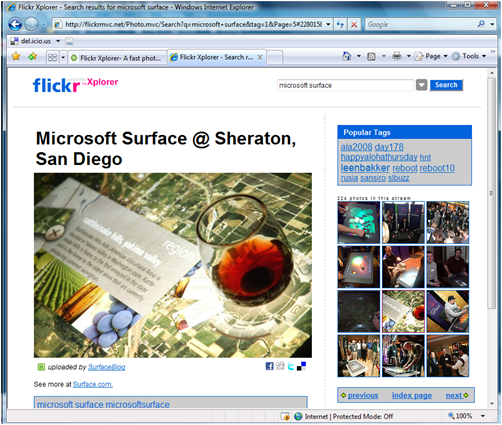 Updated on 28th June 2008 - Restructured, renamed and added social features. Updated on Sep 29 2008 - Update to MVC 5, Please check for the newest updates in source tab and all are pushed to live. AS sky is the limit, you can try to make an desktop application and add upload to Flickr option too. That will rock! If you are already logged in flickr , then the flickr authetication process wont prompt you wih a login screen , rather it will authenticate and it will ask for your permisson to grant the app if not previously. I hope that you are using the lastest source code. Check www.flickrmvc.net , where there is a nice login and logout bar the top and along with the latest source. I only want to get some latest photos of mine to show on my website, no need to edit, upload..., only display, do I need to authenticate to Flickr? Nope, you dont need to authenticate, at least it does not requires you so. There is a authenticate link , if you click only then it prompts you for authentication. Again, here all the things can be done without authenticaton , you can check it live as well. Plz also, send me the link of your site or the version of source code that is taking to you to authentication without any reason. Looks good, i will map the WebUrl to the PhotoPage for list of photos (for detail view it is already supplied by flickr), so that you dont have to do it manually :-). I will update the API the next day , i made this comment. What's hosting provider that flickrmvc.net was hosted? I'm planning to host my site but I don't know what hosting provider that support .net framework 3.5 and asp.net MVC. Can you give me some providers? I use ORCS web , it supports .net 3.5. Any plans to update to MVC2?